Snow was the quintessential stripper who might have even been insulted if you had called her an exotic dancer. I first saw her at the No 5 Orange Street sometime in the late 70s. She had white skin and jet black hair. She was the kind of woman that had I seen her in New Orleans one Christmas Eve of 1966 I would certainly not be writing about her here while sitting in my living room desk facing my Vancouver garden. I would have somehow stayed in New Orleans. I was alone in New Orleans as the only passenger in a slow cargo ship that was taking me home to Veracruz. I decided to walk on Bourbon Street. I entered a burlesque parlor and sat down at the front. I stupidly ordered bourbon thinking that was what I was supposed to drink. I watch a bored looking woman step on a stage. She plugged in something and as soon as the music began she danced without feeling or grace. If this is what a stripper was supposed to do I was not impressed. The music stopped. She unplugged the music machine (it may have been a juke box) and disappeared in the back. I returned to my ship. Everything was quiet. Everybody was drunk. I was sober. I was melancholy. Sometime in the early 80s my wife asked me if I would want to shoot some pictures for her company’s calendar (it was a chain of stores called Mariposa). I thought this would be fun. When we decided we would use the Cloverdale Rodeo for a location I made sure that Snow was one of our models. When we arrived at the scene of the rodeo I gave the models the clothing they would have to wear. Snow promptly took all her clothes off, outside the car in the parking lot. “You can’t do that,” I told her.” Her retort was pure Snow,” If you’ve seen it once you seen it. Who cares?” I did but I could not find a way to tell her that even though she might parade her body in strip clubs every day that did not mean that some of us felt that respect was due. As I was driving our Malibu to and from Texas there was not one evening (it never rained in the evening) that did not surprise me with a glorious sunset made even more special by the big skies of Texas, Arizona, New Mexico, Utah and Montana (even Idaho obliged one evening). 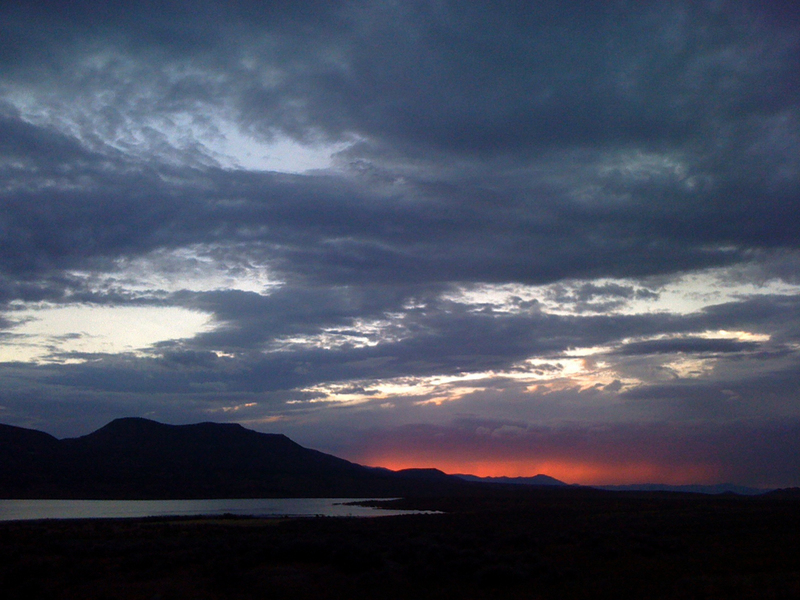 One of those sunsets, the one you see here which I took with my iPhone3G while my granddaughters groaned as I stopped the car to take yet one more picture, was somewhere in Utah. As I look at it I almost want to agree with Snow (she died some years ago) and say that once you have seen it once then who cares. But no, she was wrong and so was I.